The school house at Bedford Corners was known as Joint School District No. 7 of the Town of Portville and Little Genesee. It was built in 1864 on land that had been given to the school by Jacob Bedford. The previous building that had served the district was located on leased land a short distance north of Dodge Creek Road (now Portville-Obi Road or State Route 305) on the border of Cattaraugus and Allegany Counties. In February 1864, a committee was formed to look into the building of a school house suitable for the district and a tax of $400 was raised for the project. The following was recorded in the minutes: "Moved and carried that they build a studded house, the studding to be of Hemlock two and one half by five inches in size to be put sixteen inches from centre to centre, the length of the same to be left at the discretion of the building committee but the school room must be fourteen feet between joints." The Bedford Corners School House was built in a Vernacular Greek Revival style with the use of wood framing which was established only years earlier. The building consists of three parts: a front wood porch, the main class room, an attached wood shed. The floor is approximately 1185 square feet with attic space above the main class room. The bell originally hung from a belfry at the front of the school house and was rung when a rope was pulled from inside. The Trustees voted to remove the belfry in 1922 and to fix the bell. The original bell was mounted in the attic and continued to be used. A louvered opening in the top center of the front gable was added about this time so that the bell could be heard from inside the attic space. Separate doorways provided entrance to the front of the school house, one for girls and one for boys. Shelves were installed in the entryway vestibules to store their personal belongings. One large room provided enough space for teaching multiple grades. All seats were double in order to accommodate two students. Recitation benches were located in the front of the room. Another bench on the side held a bucket which students took turns filling at a nearby spring. Meeting minutes from 1877 stated that the following series of textbooks were to be used at the school: Sanders Union Reader, Sanders Speller, Robinson's Series of Arithmetic, Browns Grammar, and a Geography Series. The teacher's desk was located on a raised platform at the front of the room. A large blackboard filled the entire front wall. In later years, it was mandated that teachers should not be at a level higher than the students, so the classroom was turned around and lessons were conducted from the back of the room. Additional blackboards were mounted on the back walls of the main room for this purpose. A wood shed was added in order to store the wood for the large wood-burning stove that heated the main room. The children used outside toilets. During recess in the warmer months, children played in Deer Creek next to the school. They were sometimes offered treats of cheese curd from the cheese factory across the road. 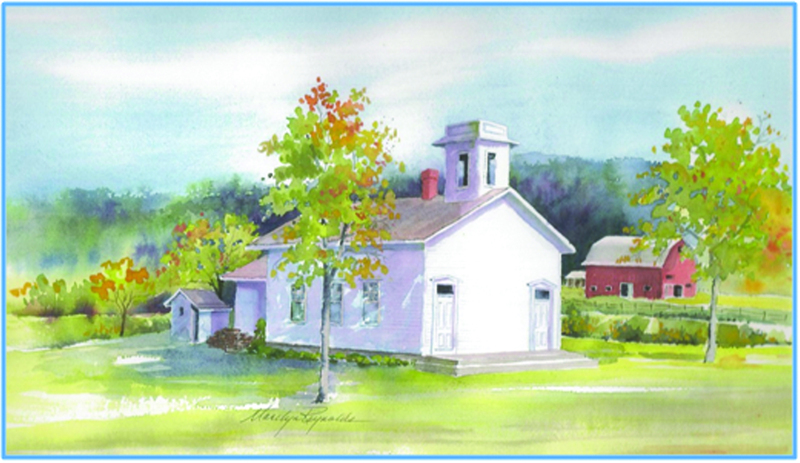 By the 1940s, the Bedford Corners School was one of ten schools serving Portville students. On June 29, 1942, eligible voters approved the centralization of the Portville area in a vote of 434 to 342. Thirty of the thirty-five voters in District No. 7 also signed the petition for centralization, making District No. 7 part of District No. 3. The construction of the new building and consolidation of all the Town and Village students took many years, so the Bedford school remained open until the late 1940s. Over the years, the Bedford school house had been used as a meeting place for various church groups and Sunday school classes so it was not surprising that in 1950, the voters of District No. 7 petitioned the School Board of the newly centralized Portville School not to sell the Bedford School House but to allow it to be used by local non-denominational religious groups. It was deeded to the Adult and Youth Fellowship Group called The Bedford Light Mission but by 1965, the building had fallen into disrepair. Charles Eshelman was interested in acquiring the property and spent many years restoring the building until he donated it to The Portville Historical and Preservation Society in 2001. PHPS has been working on the building for the past 15 years and is close to completing the renovation. The School House at Bedford Corners is unique in that it is the only remaining one room school house in the Village and Town of Portville. It alone portrays for the community the evolution of the New York State school system in the rural areas of Portville. The good fortune of its preservation must be credited to its former owner, Charles Eshelman. This is part of the overall Bedford Corners Historic District.